Top Ten Tuesday is hosted at The Broke & The Bookish. Here is a look at a few of the books I’m excited about reading when they are released in the next few months! I am so excited for a lot of these! Especially Fever and Article 5. We are receiving Article 5 soon if you want to come check out our review, you definitely should! you can check out our top ten tuesday here! I completely forgot about John Green’s new book. Of course I will read that as soon as it comes out! Thanks for the reminder. I have Fever on my list, too. 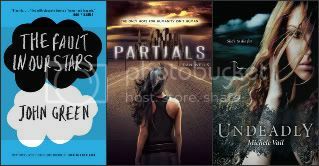 Partials looks really interesting. And I have an ARC of The Fine Art of Truth or Dare that I really need to get to … Especially since the book is releasing on my birthday! Great choices there. Happy reading! So many awesome books on you list! I’ll definitely add Fever, Partials and Undeadly on my list. Hear nothing but good things with Froi tho I haven’t read the series. I really need to get hold of the Parasol Protectorate books! What a great list. I should have added John Green’s book to my list as I will definitely be getting it and there are several others from you list I will want to read too. I want to read almost all of these. Although I have no idea what Partials is about. We have similar lists! 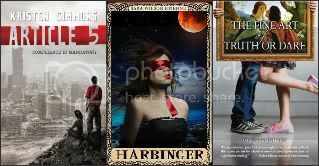 I looking so forward to reading Born Wicked, The Fault in Our Stars, and Harbinger! Article 5 and Born Wicked are two others that I wish I could have added to my list. Ten books is definitely not enough. Happy Reading! I’m definitely excited for a lot of these books! Article 5 and Born Wicked are definitely two I’m looking forward to. You have some of the same ones I do. The next few months have some really exciting books coming out! Enjoy! Great List! I can’t wait to read The Fault in Our Stars! I adore john green!